Getting in on the mirror shade trend I couldn't resist customizing a very allergic to vanilla pair of SEE sunnies. The tortoise shell frame is elegant and classy, but the quirky shape and fun lens tint give it a modern edge- just the way I like things! Photos by the fab Stylequake. great layering! I love it! Thanks, doll! Layering is so essential all year long around here! How is it you are always so on-trend YET a few steps ahead!!? Always amazed by your style + these pics are absolutely pimp-TASTIC......ok.....seriously that last description was kinda dumb, but it was the only adjective I could think of in the moment! Forgive me! Haha. We are so totally going to meet one of these days ;) Hope you are doing well ma'am!! Girl, pimp-tastic is kinda amazze! :) You. me. meet. soon! Loook at that view girl! So fab to go with you amazing outfit! I finally got some booties because they look so rad with pretty little dresses just like thiiiis!! LOVE that bag! And those sunnies look amazing on you. :) thanks, dear! Love my SEE sunnies. Loving everything about this outfit! 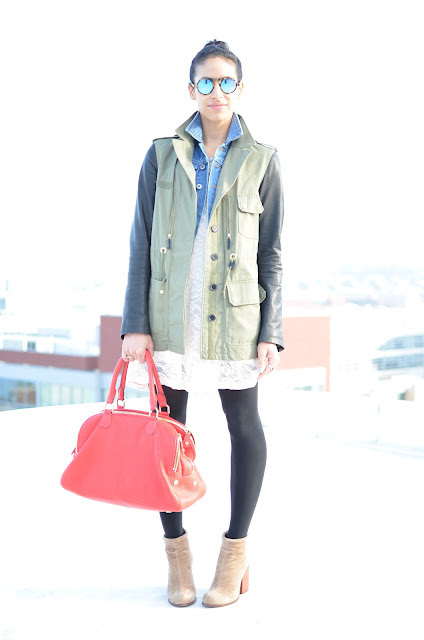 Green jacket and camel booties are such a cute combo! Have an awesome weekend darling! Very cool layered look. Love the sunglasses!